Welcome to the Wacky World of Woodhead! 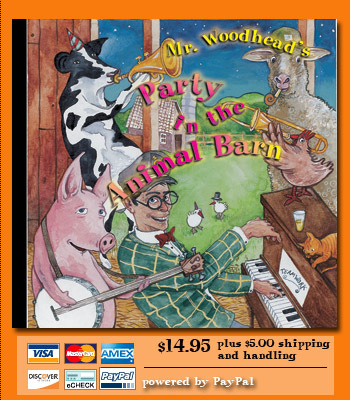 There's a new sound in children's music, and it's all on the debut CD collection from Woody Keppel called Mr. Woodhead's Party in the Animal Barn. 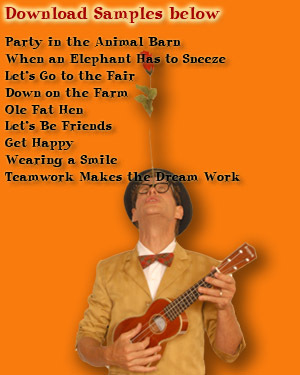 If you've ever wondered about the inner life of farm animals, the title track "Party in the Animal Barn" will definitely give you something else to ponder. It is a rockin' song that tells an imaginative story of what happens when a farmer and his wife go out one night. After listening to Dudley jam on the saxophone, you may never look at donkey the same way! "Ole Fat Hen," which tells of the chicken yard antics of a rooster and a hen; and "Let's Go to the Fair," which puts to music the youthful excitement of a fair coming to town. In a league by itself is the sure-to-be classic, "When an Elephant has to Sneeze," which uses an unusual arrangement of instruments, especially the trombone, to create a sense of both the lumbering pace and deep vocal sounds of an elephant. Please sample the tunes by clicking on the link at right.